the poems of Robert Priest, "Pain not Bread"; and "Oni the Haitian Sensation"
Apart from a granite stele that marks the place in an open field where the United Church once stood, the red schoolhouse is all that remains of Desmond, Ontario. The church burned down in the sixties, the last students left in the early seventies, and now Desmond is a place where two dirt roads cross in the rural gut of eastern Ontario just outside of Kingston. 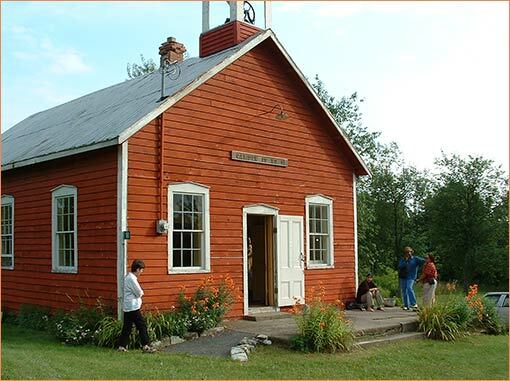 For the last three summers in mid-August, Desmond changes and the red schoolhouse becomes the site of an annual Poetry Primer, a poetry performance festival that welcomes poets and performers from across Canada and the United States. The schoolhouse was built in 1878. It’s interior decor is unchanged since the 40’s or 50’s. There’s a cast-iron wood-stove, wall maps that show a world before the collapse of the British Empire. A strap hangs within easy reach. There’s no plumbing; for water there’s a hand pump on the porch outside, and out back there’s an outhouse, a two-holer that was tarted-up for the festival with aloe hand-wipes and of dishes of potpourri. It’s an intimate and wholesome affair, this festival. Before the readings poets and volunteers gather outside the school at wooden picnic tables set-up for the evening meal. The corn on the cob is fresh from Jill’s garden, the wine is home-made and the vintage excellent, "Poetry 2004". The coconut cream pie from the Waterfall Inn in Yarker, Ontario was the best I’d ever tasted. Each evening after supper, our host and festival organizer, Jill Battson would sound the school bell to bring the audience in to start the proceedings. Jill Battson, the organizer of this eclectic event, has been a tireless impresario of poetry events for the last decade. In 1995, she put together poetry video spots for MuchMusic which spun-off into the "Word-Up" CD for Virgin. It remains one of the strongest compilations of performance poetry from that time. She hosted a number of reading series in Toronto including one in a boxing club where the poets read from inside the ring. She’s also an accomplished poet-performer in her own right with several chapbooks published and two collections of poems published by Insomniac Press in Toronto. In past years the festival has invited luminaries from the New York performance scene, reg e gaines and Reggie Cabico have performed. From Canada Paul Dutton, bill bissett, Clifton Joseph and Lillian Allen have all made appearances. This year the festival hosted Canadian poets Ian Ferrier and Maureen Scott Harris and presented musical performances by The Poetics with Nancy Bullis, the extraordinary art-song of Christine Duncun in her duo Barnyard Drama accompanied by Jean Martin, as well as a performance by the duo Bent Tail of Vancouver poet Heather Haley and guitarist Julie Vik. This year’s program brought together a disparate mix of performance and text centered poets, poets who focus on the social and those who spoke of the affairs of the heart, poets reading in French and English, and local writers and along with those from the city, all on the same bill. Such diverse program choices are often a necessary compromise with federal, provincial, municipal and corporate agencies all of which have agendas that must be catered to. But such programming poses a risk. Strong performance work, with its use of humor and its energetic presentation can intrude upon and ruin the listening experience needed for introspective work which calls for focused attention and contemplation. The intimacy of this small venue in the rural setting allowed the transitions between these energy states to take place without difficulty. After flaming verbal showers, the chorus of crickets from the surrounding fields brought the full house of 50 to 60 back to calm quickly, ready to listen to the tenderest of verse.